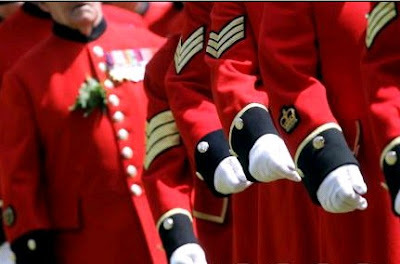 These splendid, red-suited old soldiers paraded for an hour, standing for attention in the heat and then marched past the Princess Royal.This magnificent event, redolent of all that is best about Britain, was attended by senior generals, Baroness Thatcher, John Major and approximately 3,000 other friends of the pensioners. But Defence Secretary Des Browne was nowhere to be seen. When I asked a MoD official to explain his absence, he cited unspecified 'other commitments'. The Government was represented by Tessa Jowell, the Paymaster General. Ms Jowell turned up dressed casually in a pair of trousers and paid practically no attention to the parade, concentrating instead on sending text messages on her mobile phone. Truly shameful. It is a delicious irony that Mandelson, that most committed of Eurosnouts, could save the UK from the Lisbon Constitution Treaty. The Telegraph reports that Irelands growing 'No' movement in the forthcoming referendum is due in no small part to the Trade Commissioner's unpopularity there; the Irish fear the current round of the Doha trade talks could hit their farmers hard. In an effective Euro army the tanks would be German, the soldiers British, the cooks French and the uniforms would be designed by the Italians. So no doubt we'll end up with a force with Italian tanks, French soldiers, British cooking and German uniforms. John Major was always a good egg. Blair's monstrous ego gave him the deluded self-righteousness that everything he believed was the case; Major's honest self-doubt gave him a reflective and quietly serious mien perhaps not perfectly equipped for the rough and tumble of PM's questions but infinitely more reassuring than Blair's egomania. On assuming office, each PM must write a letter in his own hand instructing the commander of Britain's nuclear sub at sea what to do in the event that the UK is wiped off the map by a pre-emptive nuclear strike. Faced with this task, Major immediately cancelled his first planned weekend as PM at Chequers and went home to Huntingdon to think about it. One dares not imagine Blair's approach; a scrawled note quickly dashed off from the office sofa, perhaps, with a little Blairist quip and little circles above the 'i's, signed 'Tony'. So when John Major wrote a piece for the Times today on 42 day detention, you can be sure he gave it the gravest consideration and has taken great care in what he says. Nor do I believe that anyone can defend another government innovation: a national identity register containing the DNA of tens of thousands of people who have never been charged with an offence. Under present legislation, DNA can be retained permanently for even minor misdemeanours, such as being drunk. A total of more than four million samples are already on the UK database - far more than in any other country. This includes tens of thousands of children, and a disproportionate number of black men. If this is accepted, it will one day go farther. This cannot be right: for me, it is all uncomfortably authoritarian. Whilst Brown postures vacuously about a 'Britishness' he neither understands or cares about Major pleads for MPs to remember who they are and where they came from. Hear him. During the recent debates about MPs' pay, the point was made a couple of times that their European equivalents earn more. Now, when Guido has seized on the Chichester story a couple of days after he was condemned here, the defence is being made that this sort of behaviour is fine because the rest of the Europeans all do it. What piffling rubbish. When Louis XIV was splurging the wealth of the French nation on Versailles, Charles II and James II huddled by the bleak firesides at St James' palace, a suburban semi in comparison. When Mad Ludwig of Bavaria was building his gilded fantasy castles around southern Germany, Victoria ruled smugly from a modest middle class house on the Isle of Wight. When Mussolini stole from the state treasury to build pompous and ridiculous fascist temples across Italy, Stanley Baldwin sprayed his roses for greenfly and donned his slippers to listen to the news on the wireless. When Ceaucescu bludgeoned his starving people to stick another thousand tonnes of pink marble on his vulgar palace, Margaret and Dennis did the washing up in the small flat above the 'shop'. European politicians are regarding Chichester's embarrassment with amazement; as far as the French, Germans, Italians and Spaniards are concerned, the whole point of politics is the opportunity for corruption; they ask incredulously why else would anyone want to do it? The point is, we're British. We're different. Our greatest folk hero is someone who serially humiliated those who stole from taxpayers. Chichester's porcine features do nothing but remind us of Guy of Gisborne. If the Queen uses a tupperware cornflakes box on her breakfast table and won't replace a rug until the hole has worn through to the boards beneath, we're not going to stand for some oikish MEP dining off gold plate at the public expense. We expect the Foreign Secretary to turn up at Downing Street in a black cab, and Camden MPs to jump on the No 24 for their daily journey to work. We just do. Any politician who hopes to win a place in the heart of the British public really has to understand this. You don't have to be an Anglican or even a Christian to see the sense in Archbishop Sentamu's condemnation of the culture of rights without responsibilities. The Gordon Gecko 'greed is good' message may have been born in the 80s but it has been Labour that has institutionalised it in the past decade. Labour's message has been that it doesn't matter if you're stupid, lazy, clumsy, inept, ugly, talentless, unskilled and with the social abilities of a crab, you're entitled to the same material rewards as those at the opposite end of the spectrum. Sentamu's message - and his church's - is that who enjoy the benisons of talent, ability, skill, intelligence and emotional adroitness have a moral responsibility to those bereft of these qualities. It's not about wealth, it's about worth; worth means dignity and belonging, not material possessions. I grew up in a village whose main street had grown organically over a thousand years; here the Georgian frontage of a well-known writer, there the timbered mullions of a foreman in the local paint factory, and between them the tiny flint cottage of a railwayman's widow. What united them was a shared cultural identity, shared values, a common morality and a sense of place and purpose, and the glue of these things was far stronger than the differences in their material wealth. Our current Government is in danger of sacrificing liberty in favour of an abused form of equality - not a meaningful equality that enables the excluded to be brought into society, but rather an equality based on diktat and bureaucracy, which overreaches into the realm of personal conscience. It is a plea for the place of morality, of conscience, in our lives. This must spring from within each one of us, and be allowed to blossom to shape our lives, our relationships and our society. It can't be replaced by a ruthless political redistributionist agenda that seeks to force by law those things that should be freely and willingly available - dignity, belonging and worth. It has been suggested that the government's declaration of Britishness Day on the August bank holiday is an utter cockup because the Scots don't actually have their bank holiday on that day. I think it is more calculation than cockup. The British will be encouraged to celebrate the day in the traditional way; the traditional way involves copious quantities of alcohol and recreational drugs, the White Stripes at Reading, a serious assault on the bank balance and a humungous hangover. Well, a normal August bank holiday does, anyway. The capacity of the Scots for the traditional celebratory rituals is legendary. Gordon just clearly wants to keep one nation in the Union sober in case anyone invades. Kensington and Chelsea, I could hug you! Nothing epitomises our slavish dependence on the State more than road markings and layouts and traffic signs. Our streets are models of authoritarian rectitude; here we are commanded not to enter, there we are coralled by cattle pen barriers until traffic lights permit us to cross the road. Anyone might imagine a vast folio of technical statutes that compel our highways authorities to cram our streets with peremptory commands and clutter our pavements with obstacles. As the Conservative Leader and Deputy Leader of K&C Council have demonstrated, this is not the case at all. When they wanted to clear Kensington High Street of all this rubbish, when they wanted to allow shoppers to cross the road wherever they wanted, when they had confidence that drivers would take more care on a more visibly shared surface and that vehicles, cycles and pedestrians could be left to 'negotiate' without the intervention of the State, their highways managers were horrified. "Can't be done" they were told "It will be carnage." They persisted. And they found that hardly any of the rubbish on our streets was prescribed by law; instead highways managers across the country slavishly follow 'guidance' issued by the Transport Department. It's not compulsory. K&C's highways managers refused to budge. They feared that if they ignored the 'guidance' they could be held personally liable for any accidents. Eventually it took the courage of councillors, particularly Daniel Moylan, to take personal liability and push through the changes that have given us a magnificent clear and beautiful Kensington High Street. It didn't result in carnage; in fact, early studies suggest that accident rates actually fell. Zebra crossings are a particular passion of mine. I love them. Pedestrians 'negotiate' directly with vehicles, there's a brief social contract, the opportunity for eye contact and a wave or nod of acknowledgement. As soon as the crossing is empty vehicles can be on their way. They're cheap and safe and very efficient. Zebra crossings are Tory. The Transport Department hates them, and has tried for years to replace them with expensive, dangerous Pelican or Toucan crossings where pedestrians can be herded behind cattle barriers and only allowed to cross when the State says so; direct negotiation between pedestrians, cycles and vehicles is forbidden. The State decides. They're more dangerous than Zebra crossings (as well as much more expensive and far less efficient at keeping traffic moving), of course, because real people jump over the barriers and try to cross when vehicles are commanded by green lights to drive at maximum possible speed and pay no attention to pedestrians. Pelican and Toucan crossings are Labour. Now Daniel and K&C have pulled another rabbit of freedom from the hat, no doubt leaving highways managers across the nation choking with indignation. They're letting cyclists ride the 'wrong' way up one-way streets . What's more, there are no barriers, bollards, lanes or kerbs to separate them; K&C are letting cyclists and drivers negotiate the road between them. Statists will splutter with horror. K&C, I could hug you! News that Tory MEP Giles Chichester has ripped off taxpayers to the tune of £500,000 should come as a surprise to no one. Chichester and thieving scum like him infest the EU like noisome cockroaches, scuttling in the dark of expenses secrecy after the grease puddles of taxpayers' hard earned cash. Back in February an EU Auditors' report into the theft, fraud and abuse of EU Parliamentary allowances was such dynamite that it was promptly embargoed by EU officials; only members of the budget committee were allowed to read it, in a locked room under supervision. The report apparently demonstrated that the bastards were so bent that "we cannot make this report available to the public if we want people to vote in the European elections next year" one honest official commented. 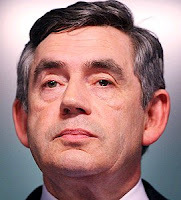 This vile malodorous dunghill of filth, sleaze and corruption shames every European. Do you trust this man to protect your liberty? Frankly, I don't. His judgment on every major issue has proven so utterly flawed, so grievously wrong and so calamitous for the nation that his judgment on the 42 days detention issue cannot be but the same. And when in the few days between now and the Commons vote next week some security service chief or senior police officer 'leaks' some spin-coordinated new threat to increase Brown's climate of fear - as they surely will - I will trust him even less. So, let's open a book now. Will the 'news' this week be that 500 Jihadist terrorists are working in the civil service, or that police are now tracking 200 terrorist groups, or maybe a raising of the threat level from 'Severe' to 'Critical' just prior to the vote? Perhaps a high profile televised 'raid' with officers dressed in full NBC kit and residents evacuated? Or will they be clever, and 'expose' an assassination threat to MPs on the basis that even the most liberal backbenchers will find the prospect of having their heads sawn off with a breadknife unwelcome? Let's wait and see. Both the key story and the leader in the Telegraph this morning focus on Labour's gerrymandering in favour of traditional Labour voting areas. This will come as no surprise to anyone; we all know not only revenue expenditure but capital investment in new hospitals, schools and other infrastructure has been skewed to Labour areas. The Comrades have convincingly demonstrated their propensity to corruption in other areas of public life - why should we expect any fair play from them in their administration of the public purse? There will be those like the Evening Standard who put forward the argument that London and the south-east pay £20bn a year or so more in taxes than they get back in public services, and to the extent that Labour is short-changing the Conservative home counties to bolster its vote in the northern metropolitans this is patently wrong. However, there remains the important principal that the costs of public goods that are nationally 'consumed' - defence, a universal postal service and the like, should not be calculated locally or regionally. There is a flaw at the heart of Labour's crooked accounting rooted in their failure to recognise that welfare causes poverty. Every tortuous rationale that Labour use to skew public spending is based on targeting 'poverty' by increasing welfarism and the presence of the client State, thus creating a negative feedback loop. The more money they pour in, the worse things get. Labour's myopic maladministration is actually hurting the northern metropolitans much more than the home counties. This will also bring to the fore again the issues of local versus national taxation, and taxation based on income, property or consumption. Indeed, these arguments will be at the heart of the appraisal of options for a real and meaningful rebalancing of responsibility from Leviathan to Local. Currently around 73% of the overall tax take is based on income or property, and only some 27% on consumption. Both are far too high in real terms. The State will always be the least efficient actor in improving people's lives, creating prosperity and nurturing self-reliant communities and a meritocratic society. This inequality at the heart of Labour's efforts at national social engineering will only increase the pressures for a more local determination of both tax and spend. This blog has always unashamedly promoted Localism and the retreat of the centralist Big State as the most crucial political reform. Cameron has been making the right encouraging noises, but has put nothing substantial on the table as yet. With Brown retreating not an inch from his commitment to a Leviathan state that overrides families, communities and intermediate institutions, Cameron really doesn't have to be too radical. Local services, such as the police and NHS, should be directly elected. And local communities should be positively helped to run local schools, housing estates and childcare centres. These policy priorities go well beyond the new Labour agenda of 1997. They go with the spirit of the times. In a more insecure world, where citizens are more informed, people want to exercise far greater power both in their own right and in their communities. This is the zeitgeist. It is about empowering citizens and communities so they can realise their own aspirations to progress. It contains a redefined relationship between state and citizen in which government controls less but empowers more. It's not a bad start. But Brown certainly isn't the man to develop a Labour renewal based on Localism - the concept is anathema to every fibre of his purblind presbyterian soul. The Saudi religious police, officially known as the Commission for the Promotion of Virtue and the Prevention of Vice, keep Saudi society under strict control by patrolling for such sins as women drivers or man and women talking to eachother in public. In 2002 14 Saudi schoolgirls were trapped in a burning building; nearby men were prevented from rescuing them by the religious police because they were not related. The girls died. Today in the UK we are starting to feel similar stifling and suffocating effects from the Bin Police. Overfill your bin, put a ketchup bottle in the wrong bin, leave it out an hour too early and you run the risk of a swingeing fine and possibly a criminal conviction. Plus the council's refuse manager can use RIPA to tap your phone and read your emails to check whether you boast to your aunt of hiding cabbage leaves in your non-food waste receptacle, or putting tetrapaks in your recycling bin. The justification for this most illiberal and repressive enforcement of the trivial is that it's necessary, that the UK has run out of landfill capacity and we must reduce and recycle or die. Charging for refuse by the kg will be trialled before long; a splendid wheeze to extract even more money from the settled middle classes who pay their council tax by direct debit and won't notice an extra tenner a month going out, but howling lunacy if applied to the sort of drifting bedsit population that pays for its utilities through pre-payment meters. We have always traditionally disposed of our waste through landfill, whether a midden at the bottom of the garden or a worked-out quarry. It's cheap, and as long as only inert waste is deposited near the water table, environmentally friendly. Now personally I loathe plastic packaging waste, and strongly support economic recycling; of course we should collect and re-use metals, glass and paper. But broken crockery, cat litter, paint tins, old furniture and the like still need to go somewhere, and a hole in the ground in which they can slowly degrade to their natural mineral elements is about the best place. So just how critical is the UK's supply of landfill sites? Well, not very at all. We quarry about 260 million tonnes (mt) a year of land minerals, mostly limestone, granite and sand and gravel, plus 9mt a year of opencast coal. In terms of volume, that equates to new holes with a capacity of about 110 million cubic metres (mcm) a year. Our existing licenced holes have a capacity of about 700 mcm. We produce less than 100mcm of waste and refuse a year. The system, as scientists would say, is therefore in equilibrium. There are regional imbalances, of course. In order to counter the south-east minerals 'drag', following the recommendations of the Albemarle Report many years ago, a policy of licencing superquarries in Scotland and the north and transporting their products directly by sea or rail to the south-east means that Scotland and the north have more holes than waste to fill them with. And the landfill 'push' from London which places additional demands on sites in the home counties means that the M25 area has more waste than holes. The solution to this is patently obvious. Why have ships and rail wagons returning to Scotland empty? No. No natural problem, really. The 'crisis' has been created artificially by a combination of EU blind stupid regulation and the Labour government's cupidity. Tyres, for example, are now classed as 'hazardous' waste in the same class as hospital waste and strange glowing chemicals. Artificially witholding waste disposal licences from perfectly suitable holes in the ground creates an artificial shortgage. And the government have not only imposed an aggregates levy that taxes minerals coming out of the holes but a landfill tax that taxes waste going back in to fill them up. Landfill tax is currently £32 / tonne and will rise to £40 t next year and £48 t the year after. Local councils have to pay these charges, but receive nothing extra from government and are restricted from raising council taxes generally to pay for it. Small wonder, really, that the Bin Police have taken off in such a big way and that councils in London are looking at 10p/kg charge to cover not only these and fuel costs but the costs of compliance with Ken's emission charging scheme. There's no crisis. Just Brown's stealth taxes.